Printing in RadScheduler is performed by objects of type SchedulerPrintStyle. The print style object provides a set of options that define the date range of printing and the appearance of the printed pages. SchedulerPrintStyle is an abstract class and cannot be instantiated directly. You should use one of the following implementations: SchedulerDailyPrintStyle,SchedulerWeeklyPrintStyle, SchedulerMonthlyPrintStyle, SchedulerDetailsPrintStyle. When applying a specific PrintStyle make sure that you set the relevant ActiveViewType for RadScheduler. The SchedulerDailyPrintStyle class defines printing of RadScheduler in a daily manner. Each day is displayed on a separate page. The appointments are arranged in a grid similarly to the SchedulerDayView. The SchedulerDailyPrintStyle provides properties for changing the size of its specific visual parts: the hours column on the left and the area for all day appointments. Additionally, you can allow printing two pages per day. The second page in the mode is reserved for notes. 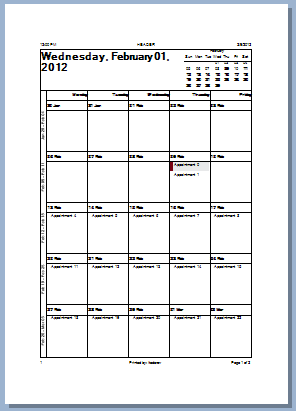 In the WeeklyCalendarPrintStyle the appointments are arranged in a grid where each column represents a day. And each row represents a specific time frame. This style provides properties for changing the dimensions of its visual parts and the font for the header cells. HeaderCellFont: Allows the font of the header row to be changed. HeaderAreaHeight: Controls the height of the header row. HoursColumnWidth: Controls the width of the header column. AllDayAppointmentHeight: Controls the width of the all day appointments section. MaxAllDayAreaHeight: Sets the maximum height all day appointments section. The default value is 180 pixels. 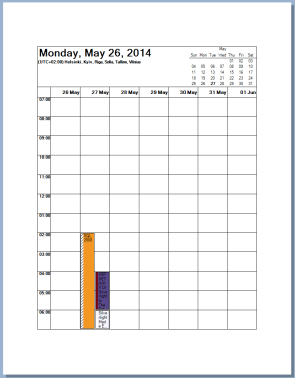 The SchedulerWeeklyPrintStyle class defines printing of RadScheduler in a weekly manner. Each week is displayed on a separate page. The appointments are arranged in a grid in which each cell represents a day of the week. 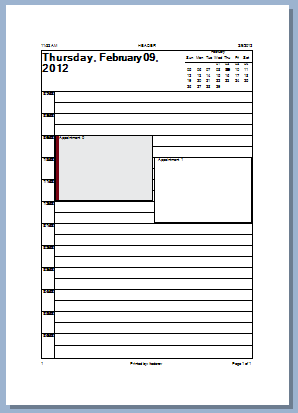 The SchedulerWeeklyPrint provides properties for changing the height of the appointments and the layout of its visual parts. 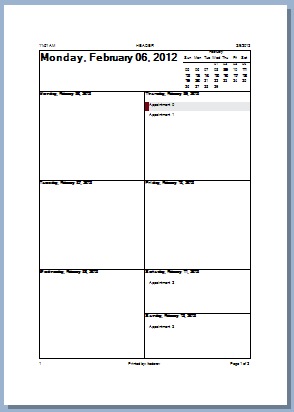 TwoPagesPerWeek: Allows printing a week in two pages separating the week in two. 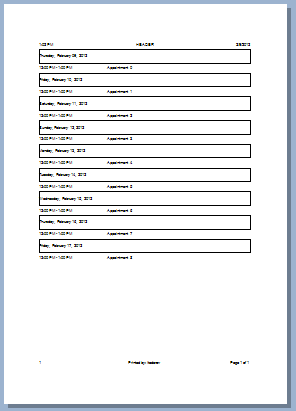 The SchedulerMonthlyPrintStyle class defines printing of RadScheduler in a monthly manner. Each month is displayed on a separate page. The appointments are arranged in a grid in which each cell represents a day of the month. The SchedulerDetailsPrintStyle defines printing of RadScheduler in a continuous manner. Appointments are printed in ascending order of their start date. This mode does not provide page headers. Default: The printing continues to the next page there is no space left on the current page. Day: The printing continues to the next page when the next appointment has a different date or there is no space left on the current page. Week: The printing continues to the next page when the next appointment is in a different week or there is no space left on the current page. Month: The printing continues to the next page when the next appointment is in a different month or there is no space left on the current page.